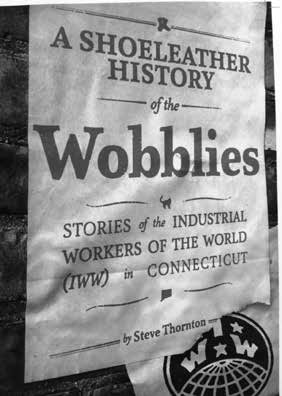 A short review of A Shoeleather History of the Wobblies: Stories of the Industrial Workers of the World (IWW) in Connecticut. The newer books, such as: “Oil, Wheat and Wobblies,” “Joe Hill: The IWW and the Making of a Revolutionary Working Class Counterculture,” “Harvest Wobblies,” and “Wobblies on the Waterfront: Interracial Unionism in Progressive-Era Philadelphia” are all books that can be used to inspire new forms of Wobbly activity. “Shoeleather History of the Wobblies” is an interesting addition to the collection of new IWW histories. Unlike most of the aforementioned books, itis not an academic work. In this way it is more like Franklin Rosemont’s book on Joe Hill. “Shoeleather” is a collection of essays and vignettes about the IWW and its work in Connecticut. It is divided into sections on free speech fights, organizing/actions, repression, and individuals. The entries are usually very short, but interesting and well-written. I have only two small criticisms of the book. The section on repression Graphic: shoeleatherhistoryproject.com somewhat falls into theold misconception that “the IWW in the U.S. collapsed because of government repression.” This has been disproven and the sooner we move on to analyzing what actually did happen, the healthier we will be as a union. Second, there were major efforts to organize Metal and Machine Workers Industrial Union (IU) 440 in the 1930s in Bridgeport. These efforts were built on successes in Cleveland. I’m not faulting Fellow Worker Thornton for the oversight; it’s pretty obscure and not mentioned in major histories. It would be interesting if any information could be found on those efforts. The author, Steve Thornton, is a member of the IWW. I thank him for his efforts in this book.